If you find that your intercooler and intercooler pipes contain a lot of oil, its because the vent hose that runs from the valve cover to the turbo inlet hose puts a lot of oily blow by into the intake, intercooler and piping. When oil builds up inside the intercooler, it drastically reduces the intercooler efficiency. Sure you can spend $10 and install just a small breather filter, but that will not resolve the problem, once the filter soaks with oil, it will start blowing all over your engine bay....what a mess that is. This catchcan will hold the excess oil that comes from the valve cover, and allows the oil to be drained when needed. The unit features 2 heavy duty brass inlet fittings, and a brass drain valve. It measures 7" overall, and the body is 4" tall by 2.5" round. 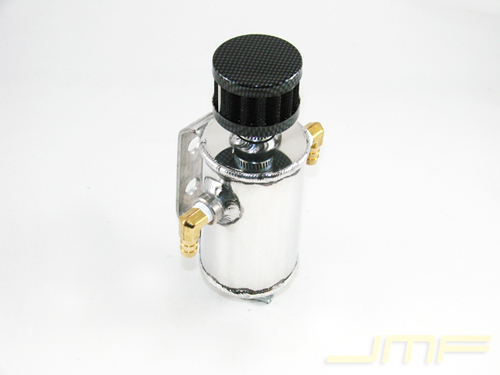 It can be installed by running a hose from the valve cover directly to the catch can, or by utilizing the 2nd inlet, and eliminating the PCV valve. Want this item shipped out tomorrow, April 24? Order within the next 22 hrs 57 mins.